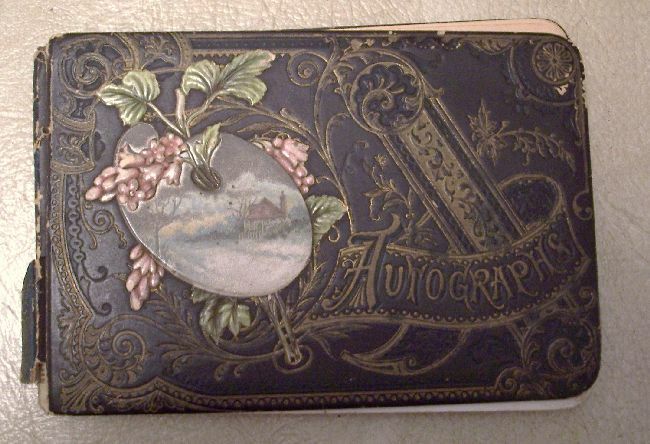 Alta Jane Bryan's autograph book, c1887. Last week I showed some photos of a few Bryan family heirlooms that I photographed last fall while visiting my distant cousin Ed. The John and Hannah (Huey) Bryan family lived in Bear Creek Township, Jay County, Indiana, in the latter half of the 19th century. I found it surprising that they had calling cards in rural Jay County back then. 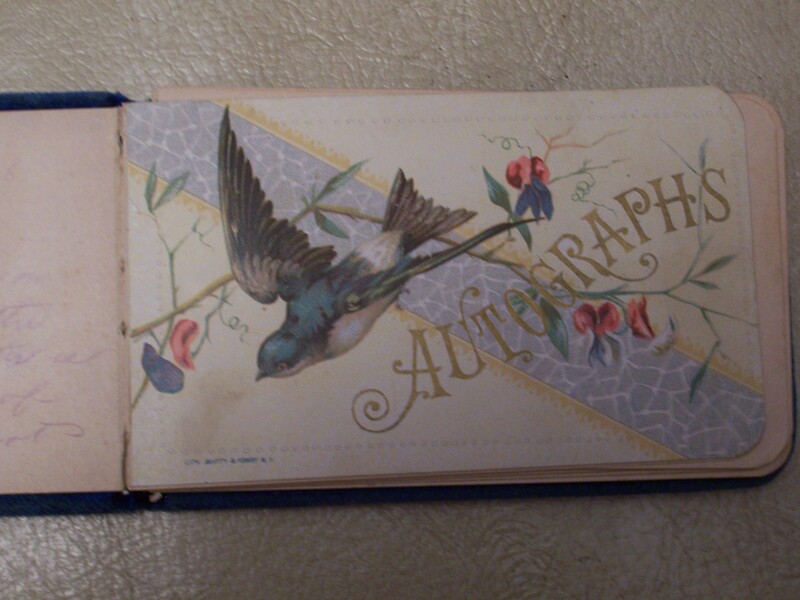 Ed also showed me two autograph books that his great–grandmother Alta Jane Bryan once owned. 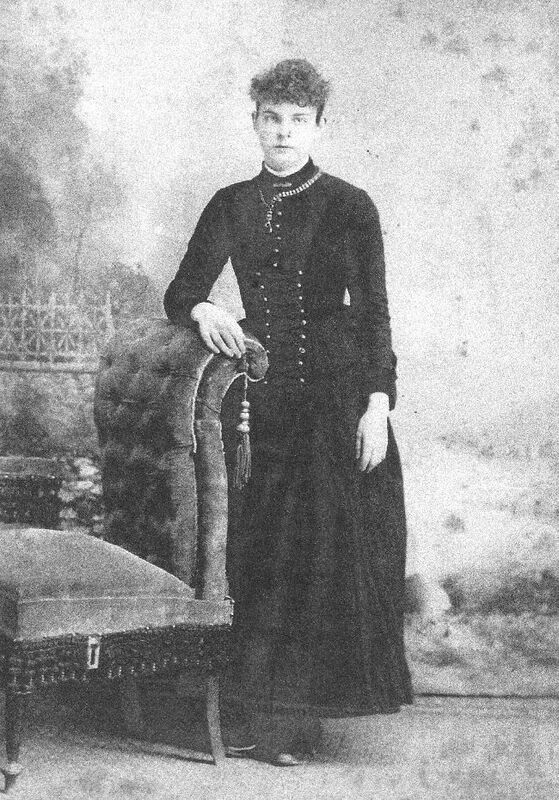 Alta Jane (1866-1946) was the daughter of John and Hannah. 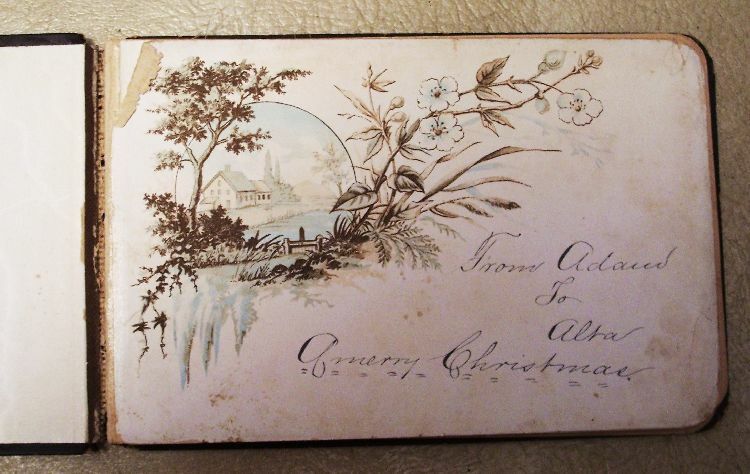 These two autograph books contain short verses written by Alta Jane’s family and friends. 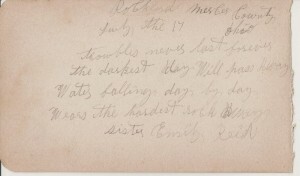 The verses were hand-written by her father, mother, two of her sisters, Byantha and Emily, and others. Emily (Bryan) Reid, was my great-great-grandmother. 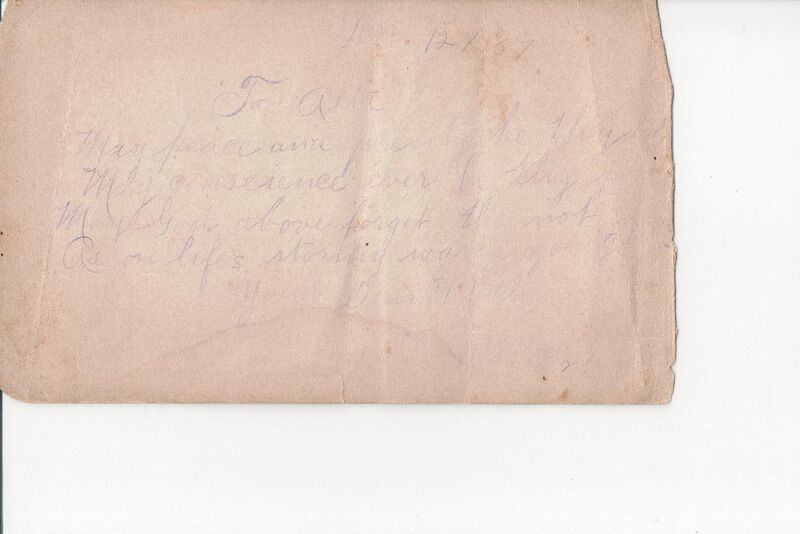 How interesting to see what their handwriting and signatures looked like. 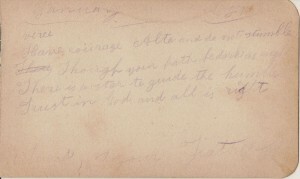 It is also interesting to read what they wrote to Alta. One of the small autograph books has a blue velour cover. 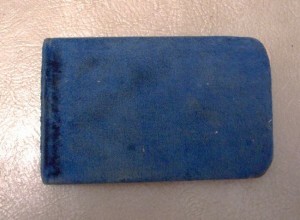 The books are a little over 5 x 3 inches. 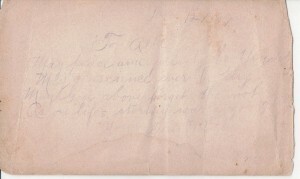 Inside of blue autograph book. Trust in God and all is right. As on life’s stormy waves you glide. Wears the hardest rock away. Who will bare the sheaves away. Rich reward he offers thee. Here am I gladly waiting. Remember me in the hour of prayer. 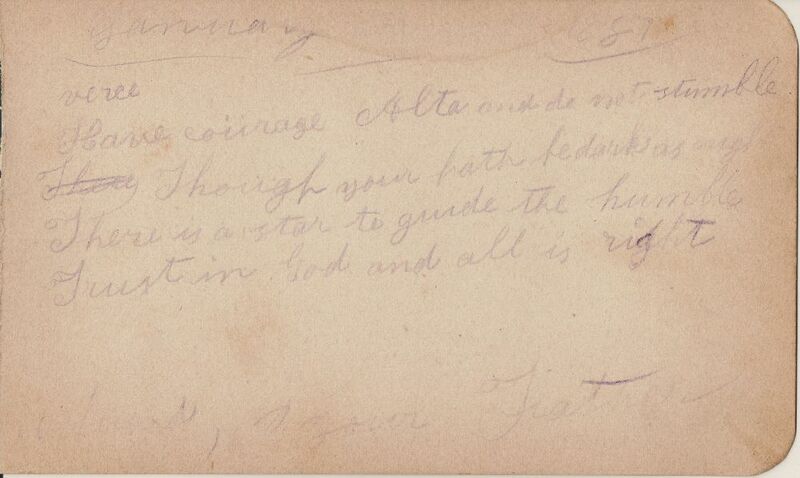 These lines from Alta’s autograph books show the Christian faith of the Bryan family. 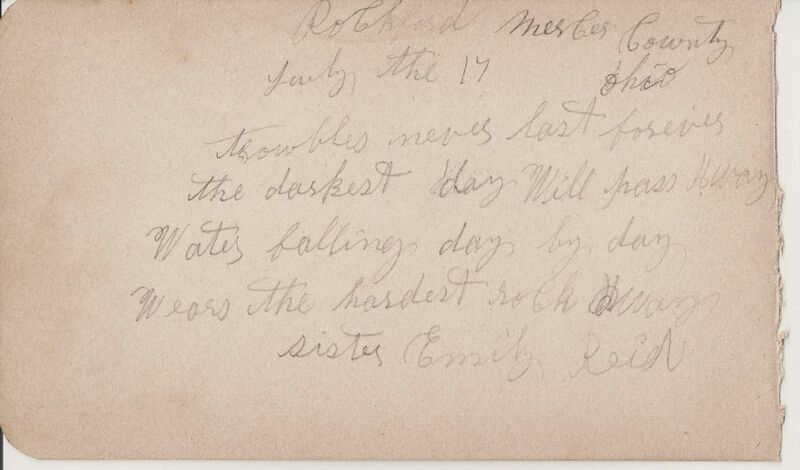 I also found it interesting that my great-great-grandmother Emily (Bryan) Reid was living in Rockford about 1888. Rockford is only a few miles from where we live. You never know where you will find information and clues about our ancestors. Dorothy Weaver once told me a story very similar to that. I wonder if that occurred at Emily’s house? Maybe Pearl was one of the girls upstairs. That would make sense that grandma and Dorothy would both know the story. Westchester is an unincorporated community in Bear Creek Township. It located at 400 N & 450 E and is very close to where the Bryans lived. 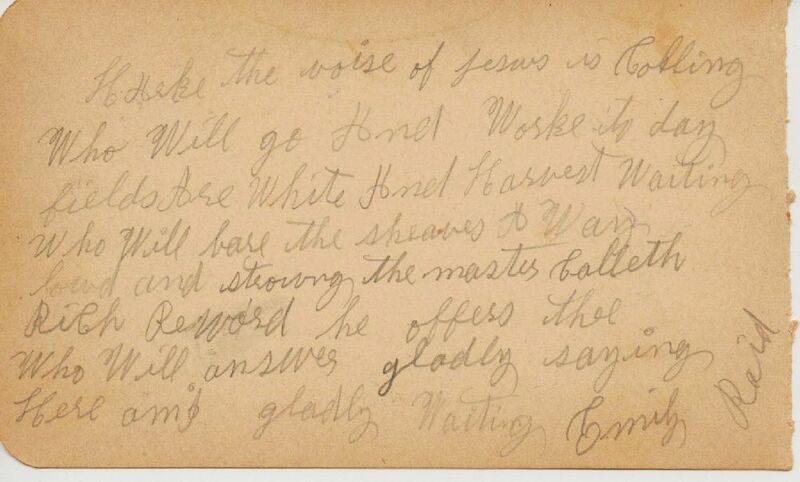 Hallet Bryan enlisted in the Civil War there. It is between Bryant and Portland but a few miles to the east. 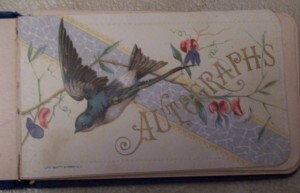 These autograph books are such treasures. 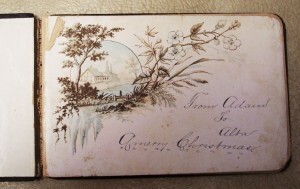 I have one from my great-great aunt. I love them because not only are they an insight into the owner’s life, but insight into the era as well. Thanks for sharing!